Get swept away in the romantic words of Mr. Darcy all over again with this lighter-than-air chiffon scarf. Get swept away in the romantic words of Mr. Darcy all over again with this lighter than air design by Keila Scott. 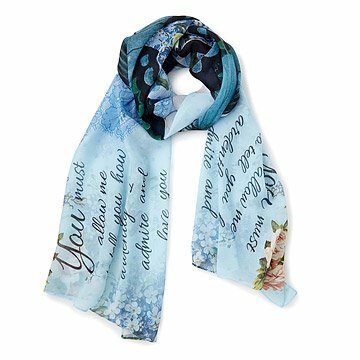 Printed across a flowing chiffon scarf, his loving declaration, "you must allow me to tell you how ardently I admire and love you" is nestled between vibrant blooms and prints of antique lace. A bold blue butterfly takes center stage, making the wearer look like she's grown a pair of wings when worn as a wrap. Printed with eco-friendly inks, this beautiful accessory is perfect for your favorite bookworm or believer in true love. Made in Brazil. After years of working for advertising agencies in the hectic city of Sao Paolo, Brazilian designer Keila Scott decided to abandon the urban jungle and move to a farm in the countryside. It was there that she began designing her unique clothing and accessories with exclusive prints inspired by popular culture and nature. Keila draws influence from her favorite films, drafting inspiration boards and imagining the characters clothed in her designs. “My most recent works have this illustrative feel to them,” she says. “It is like I am telling a story.” When she feels stuck on a project, she’ll hit the trails in her backyard sidled by her dogs, and centers her attention on the changing colors of the sky. Hand wash / No bleach / Iron low temp / Do not dry clean. You people are pushing this to much with minutae! Gave as a gift and my best friend loved it, loves. My sister loves Jane Austen. This was a perfect gift. My wife loves "Pride and Prejudice" so this scarf was PERFECT for her! Pretty gift for librarian sister! Great find for my hard to buy for sister! Very pretty! Exactly what I expected from picture. Huge fan of Pride and Prejudice and she loved this gift! Great Spring scarf. Pretty colors. The scarf is absolutely beautiful and made a perfect gift. It brought her to tears when she opened it.